Danburite is a powerful Heart crystal. All colours, but particularly pink, stimulate Heart energy and can create a connection between the Heart, Third Eye, Crown and Upper Crown Chakras, giving us a direct link with Source, bringing spiritual energy into the Heart, and promoting deep spiritual change. This encourages love of self and love of the Divine. 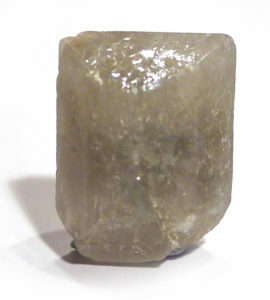 Danburite shines with a bright clear light, which some say originates from the Higher Dimensions. It creates a connection with the Angelic Realm and acts as a conduit for angelic communication. This lovely and loving mineral helps us to leave the past behind, both emotionally and on a karmic level, so it can also be used to clear energy and trauma brought through from past lives, as well as old, stuck energy (such as fear and anger) held in the Solar Plexus and grief held in the Heart. It is a strong physical healer and detoxifier with a mood-lifting effect, and releases stress and anxiety. Some practitioners associate it with passion and libido, but this isn’t a quality I’ve noted. Recently the Heaven-Heart connection seems to be much stronger, leading me to believe it is very relevant for the present time and our evolution into a more spiritual species. In addition to the properties of pink danburite, grey danburite possesses a denser, more confined energy, particularly when in the form of single crystals. It strongly connects us to our spirit guides, facilitating communication, and also has a pain-relieving effect. Danburite is a calcium borosilicate, which generally forms through moderate to low-temperature contact metamorphosis, but can also be found in high-temperature ore deposits, as well as pegmatites (igneous) and evaporates (sedimentary). Crystals are usually glassy and prismatic. The colour is pale yellow to yellowish-brown, colourless, pale pink, or grey. Colourless or yellow varieties bear a strong resemblance to topaz, but topaz can be distinguished by its perfect cleavage. Gem quality danburite is found in Mexico, Myanmar, Russia, and Madagascar. All photo examples are from Charcas, Mexico, except the grey, which is from Bolivia. Although faceted for collectors, it is rarely used in jewellery. Discovered in 1839 and named for the type locality at Danbury, Connecticut, USA. There are no traditions associated with this mineral.